This time, I've got a poem for you. Now, I'm not a very good poet. In truth, I hate writing poetry because it's a terrible and unpleasant process for me. When I do write (usually because my creative writing class forces me to) I feel like I have no idea what I'm doing. That said, don't except this to be a great poem. Now why am I sharing it if I think it's bad? Well, even if it is bad as far as poetry goes, I feel like it's one of the better ones I've written (though I haven't written a lot). 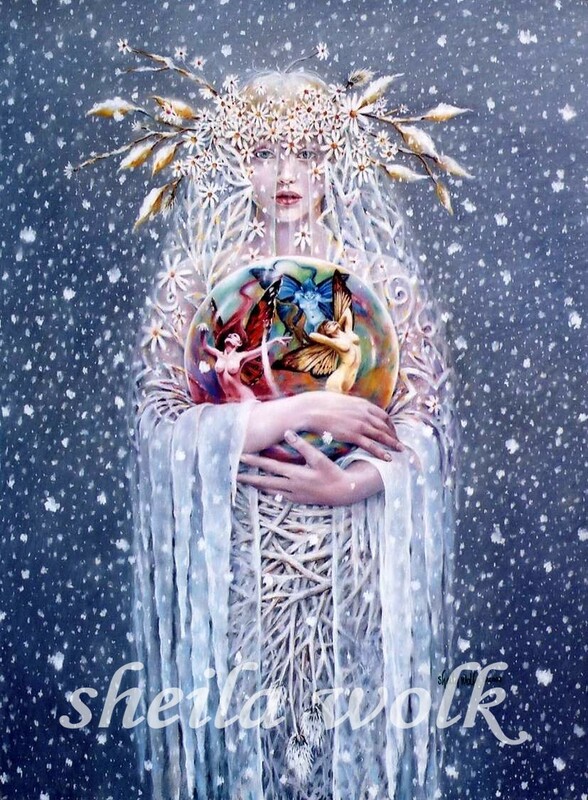 Also, it's based off of one of my favourite pieces of art: Frost Bearer by Sheila Wolk. Soft pearly fabric of her robe. Signs of life threaded into the azure locks. To carry and protect the rest. I think that's quite beautiful and moving! It's wonderful what talent combined with inspiration can produce. I think the idea is quite wonderful in itself. When it comes to its execution, I feel like sometimes the rhythm of some of the lines is a bit off. When I write poetry, I often experience similar issues and it helps me to read it out loud, so I can figure out the rhythm.